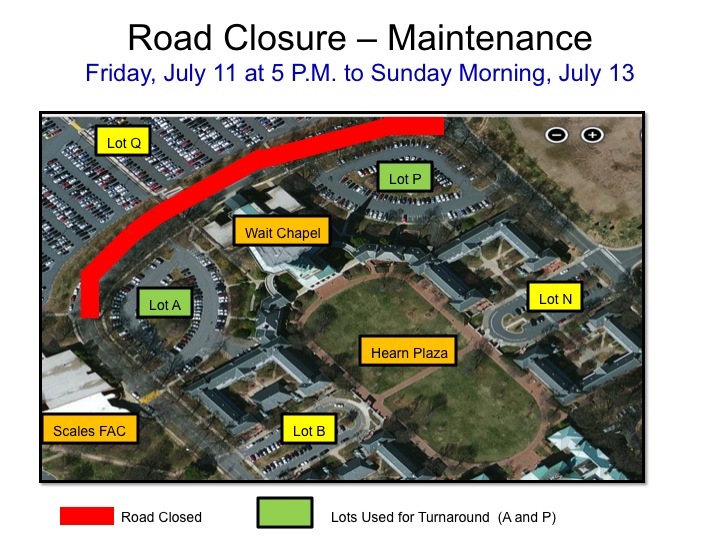 We wish to share the following parking and road closure information and provide parking recommendations/options for faculty and staff for Wed., July 9 through Sunday morning, July 13. These closures are being planned at a time that should cause the least disruption to faculty and staff parking choices. Whenever parking lots are closed, we recommend alternative modes of transportation such as carpooling, bicycles or mass transit to reduce the demand for parking during these times. Wed., July 9 – Parking Lot A will be closed for maintenance. Thurs., July 10 – Parking Lot A will re-open and parking lot P will be closed for maintenance. If weather or additional time is needed for maintenance, the closure of Lot P may extend into Fri., July 11. Faculty/Staff Parking Options: We recommend Lot J, Q and spaces on Wake Forest Rd. in front of the Chapel during this closure as spaces are frequently available during this window of time. A section of Wake Forest Rd. 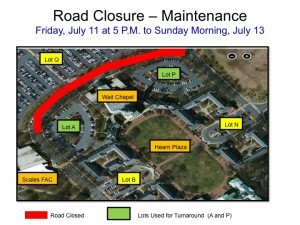 between parking lots A and P (front of Wait Chapel) will be closed from 5 p.m. Fri., July 11 through Sunday morning, July 13 for maintenance. Parking lots A and P will be accessible during this time. 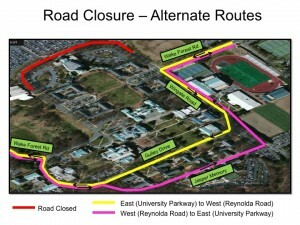 The maps above show the section of road closure and alternative routes. If you have any questions, contact Alex Crist at 336-758-2558.